Over a hundred guests were invited by Leicester jamaat for a celebratory Eid dinner at City Rooms with attendees including MPs, clergy and local community leaders. In a number of speeches they kindly praised the work of the Dawoodi Bohra community in Leicester, particularly in raising diabetes awareness, improving the neighbourhood by cleaning and refurbishing the local park, feeding the homeless, and bringing communities together in Leicester. They expressed excitement at the building of the new masjid, and extended invitations to His HolinessTUS to come to Leicester for the inauguration. “A warm welcome to all of our distinguished guests who have taken time out of their busy schedules to join us for our Eid celebration; a joyous occasion for all Muslims around the world; our sincerest thanks to all of you. This event is to mark the celebration of Eid ul Fitr which marks the end of Ramadhan, a festival which over 1 billion people celebrate. To really get into the spirit of the occasion, I have to inform all of you that food will be served after sunset. The good news is that to sustain your hunger in the meantime we have prepared a delicious, delectable and mouthwatering appetizer……my speech. As you are all aware, the Dawoodi Bohra community of Leicester is also working towards the completion of the masjid on Bath Street in Leicester. The day when the masjid is finally completed will be a historic event, one that will fill our hearts with happiness and joy; similar to what we will feel on Eid. Ramadan is the ninth month of the Islamic calendar. It is a time of fasting for Muslims. Each day during this month, Muslims all over the world abstain from eating and drinking from dawn until the sun sets as well as abstaining from anything that is ill-natured or excessive. Fasting is intended to educate the Muslim in spirituality, humility and patience. It is a time to cleanse the soul, focus attention on Allah, and put into practice selflessness. Fasting is one of the Pillars of the Islam, and one of the main types of Islamic worship. Restraint from frivolous enjoyment and curbing wicked intentions and cravings is considered an act of compliance and obedience to Allah, as well as amends for sins, faults, and mistakes. During Ramadan, Muslims request forgiveness for sins in the past, pray for direction and assistance in everyday troubles, and endeavour to cleanse themselves through self-control and great acts of faith. In the month of Ramadhan, Muslims also engage in the most amount of dua – supplication. It is also important to note that Muslims also believe that the Quran was revealed in the month of Ramadan. Eid is the holiday celebrates the conclusion of the month of Ramadan. Muslims are not only celebrating the end of fasting, but thanking Allah for the help and strength that he gave them throughout the previous month to help them practise self-control. Among the nights of Ramadhan is one special night called Laylatul Qadr-translated as the Night of Power. Good deeds performed on this single night are equal to those performed over a thousand months. There is simply no parallel to the value of this night. Each year His Holiness specifically chooses a prayer and supplication which he instructs his followers to recite on Laylatul Qadr. Inspired by this dua and other duʿās recited during the month of Ramadan, and understanding the true philosophy of duʿā, the Dawoodi Bohra community actively participate in a host of social initiatives during the Holy month. We have been visiting homes in our masjid’s surrounding area delivering small tokens of goodwill to nearly 300 homes; explaining to local residents the significance of Ramadhan and listening to their concerns about the local area and how it can be improved. One of the concerns raised by residents is the state of Linford Street Park – the park was unkempt; weedy and full of litter. The community, along with Leicester City Council took on the initiative to refurbish the park for the enjoyment and usage of the residents. We have taken out weeds; put down new wood chippings and are in the process of purchasing new equipment for the park. Further, to celebrate the renovation of the park as well as the month of Ramadan on 9 June we organised an iftaar event at the park. Residents were served refreshments and a courteous platform for discussions between community members and residents about the local area and how it could be improved was created. The aim of the event was to bring about community cohesion and integration and to extend a helping hand of friendship. During Ramadhan we continued our drive to feed the homeless. We delivered food which was prepared in the community’s kitchen to homeless shelters and to those in need in Leicester. 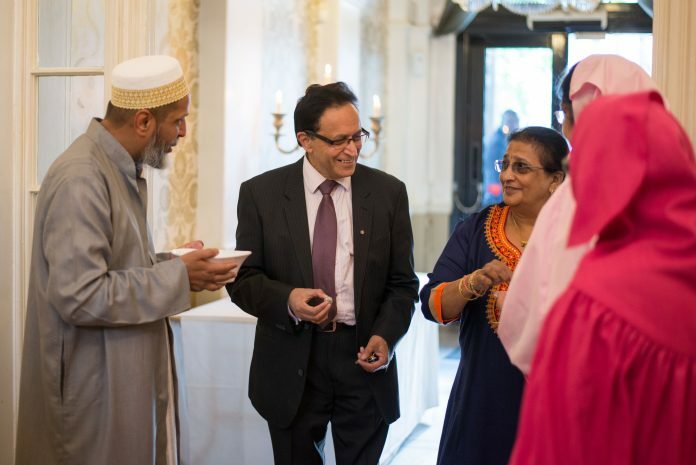 As many of you have seen in the previous events we have hosted, the Dawoodi Bohra community is actively encouraged to spread Allah’s message of benefiting, helping and being accepting of others, and of always being a constructive part of the community. Prior to Ramadhan, the Dawoodi Bohra community of Leicester organized a diabetes walk at Victoria Park, where we raised over £30,000 for Diabetes UK and Silver Star charity. His Holiness repeatedly instructs us to live peacefully among ourselves and with all communities and to remain committed to Islam’s messages of peace and kindness. He has also orchestrated many programs and facilities that allow us to be helpful to our fellow man, from cleaning drives that positively impact the health of the environment to food drives and food rescue partnerships aimed at feeding the less fortunate, to fostership and upliftment campaigns striving to provide community members with a better future, the essence of duʿā is alive within the community. These teachings of togetherness, being a benefit to society and the country we live in and being helpful to those around you have been instilled into us by our Holiness. His Holiness delivers countless sermons throughout the year delivering the message of love, tolerance, forgiveness. We, as a community, are grateful to His Holiness for his guidance and leadership and the values he has instilled in us to be a good citizen, a good neighbour and a good human being which are key to being a good Bohra. I am once again grateful that you have all joined us today at this celebratory event. Our hope and desire is that by continually working together we can go from strength to strength as a community for the betterment of all.